Disposable Chef Hats: No Fuss Hats with a Very Professional Look. Disposable paper chef hats are for the chef who doesn’t want the fuss of washing and caring for a fabric hat. These are ideal for a chef who has more than enough on his plate without adding laundering and shaping a hat to the “to-do” list every night. They function well for everyday use and are also ideal when your chef has special events where spare time is not available—seasonal banquets with back to back bookings, private parties, weddings, multiple course dinners, chef conferences, and chef competitions. 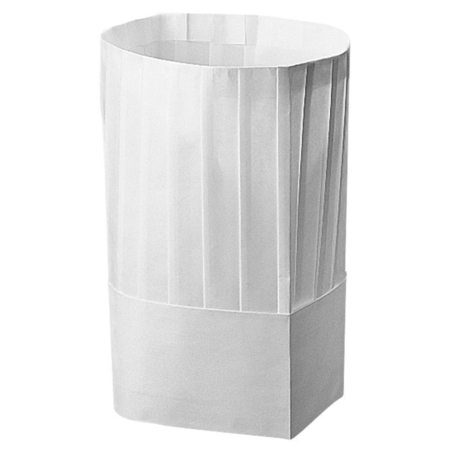 European Style Chef Hat, paper and non-woven fabric, with adjustable head sizing—to be used for up to a week. Both styles of reusable paper chef hats are 9 inches tall, come in packets of 10 and have additional discounts available on bulk orders. These are lightweight, fully pleated, and are known for comfort because of their sweatband and an adjustable head sizing. These hats are “no fuss” time savers; they’re comfortable; they’re affordable; and they still provide the highly professional look that a chef’s position demands. These are kept in stock so are available for immediate shipping. If your chef needs a no fuss option for a hat that also provides a quality professional look, check out our options for disposable chef hats. Contact us for information on pricing and any available discounts.